I had almost picked up this book a really long time ago when it first came out, but I didn't, and I'm not really sure why. I think I vaguely remember my close friend, a fellow bookworm, had thought it was kind of meh. I was still curious about the book--I mean, just look at the cover--but I thought that it could wait. And then Jenna at Making the Grade had this 'Month of the Tiger' and it was all Tiger's Curse and Colleen Houck. Being that I follow that blog closely, I thought that a month of recommending this series was plenty of nagging I needed to pick up the book. I'm not sure that I fully understand Kelsey. She wasn't a character that was exactly remarkable, but she was brave and courageous. What I absolutely hated about her was the fact that she kept on trying to convince Ren that she wasn't as beautiful as he thought. Um, EXCUSE ME. If there's an extremely hot, drool-worthy guy telling me that I'm beautiful and complimenting me REPEATEDLY, I think I'd be convinced that I'm probably not that ugly as I think I am. Just saying. But she never learned. She didn't grow as a character. Even though this series is, like, five billion books long, I expect there to be at least a minute growth in character. She was also a little annoying. She didn't think that she was worthy of Ren's love. How could you think that, Kelsey?!?! Another thing that bothered me as I read was the writing. It was amateur. Some of the situations the characters were put in was awkward at times, too. Also put into mind that this book is a monstrosity. It's long and weighs at least three pounds. It's a hefty one. So when it's full with this writing that isn't exactly right, it's a little off-putting. However, this is Houck's first book, and I hope that as the series progresses, the writing will improve. But those are the reasons why this book was not given five stars from me. There were some things that I actually did enjoy about this book. For one, the mythology. Once again, I will mention how much of a history geek I am, so historical and mythological accuracy in books are key to me. And it was great how Houck tied in all these Hindu aspects into the story. Plus, it made me super happy when Mr. Kadam, the only character that I really connected to, would explain to Kelsey about the caste system and tell her stories about Durga and the other gods. However, I didn't feel much of the local Indian culture in the story. Since a majority of the book takes place in India, I would have expected more of the Indian culture to make more of an appearance in the story. Another thing that I enjoyed about the book was that it was filled to the brim with action and adventure. I can't fully enjoy a book if it doesn't have adrenaline-packed scenes or a scenic surrounding. Besides the beginning, there really wasn't a slow, dull moment in the story. I was glued to the book and I'm pretty sure I disappeared from the real world for a while when I was reading this book. 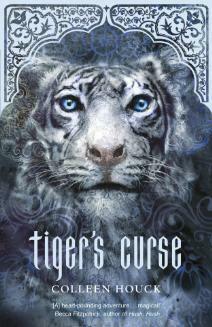 Despite the sometimes unlikable main character and weak writing, there was a lot to enjoy about Tiger's Curse. Tying in an old curse that has turned man into tiger with Hindu mythology was almost intoxicating for me and very enjoyable. I may not have enjoyed the characters at times, but the story was plenty of reason to keep me reading on. If you're a fan of big kitties, ancient curses, mythology, and action and adventure, you should maybe consider putting Tiger's Curse on your TBR list. I'm glad you saw the problems I had as well, because so many reviews gushed about this book and I just couldn't understand how they couldn't notice the absurdly sophomoric writing. BUT...like you, I kinda want to see how the rest of the series goes. If Houck improves her prose, and Kelsey has some sort of growth, I honestly think this series could have fabulous potential. Great review! I have heard so much about this series but just haven't picked it up yet. It sounds good and now that you said there is a lot of action then I think this a book I would enjoy. I love mythology too!